When a trip to the Door Peninsula ends at Journey’s End, you are destined to be delighted. Open Year-round except Christmas Eve and Christmas Day. Journey's End Motel & Cabins are set on four acres in Baileys Harbor. 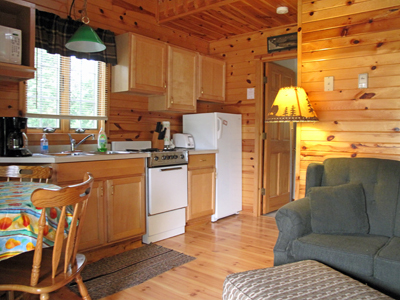 Here, guest can choose from three lovely log cabins and 10 pleasantly decorated rooms. To find Journey's End, travel north on Hwy. 57, and turn left/west on Cty. Rd. EE. Proceed half a mile to Journey's End Lane (a large wooden sign is posted there) and turn right; proceed to the property. And in 2011, they began to offer a 3 Bedroom home to rent too! Dog friendly inn! Sue's son, Andy, will be running the palce now and people love him already! All accommodations afford natural and peaceful views of trees and wildflowers on a lovingly cared for greenspace, and you are just a half-mile from Lake Michigan and the Baileys Harbor marina, shops and restaurants area. Even the area around the office, your first step for check-in, is lush. Pick up a free Tootsie Roll pop and meet Sue and Norm Becker, your hosts. They left careers in health care in the Port Washington, Wis., area to become innkeepers in 1996; in 2002, they added the log cabins to the motel rooms. Sue loves what she does, and it really shows in genuine hospitality, spotless upkeep of Journey’s End and steep knowledge of the Door Peninsula. “We have an 82% return rate. And we are meeting new people, and they are coming back,” Sue says. “We love what we do and we have the best clientele.” Yep - Sue is real people, and they really care for their guests. Sue was a nurse, so you may overhear her using health care words like “admissions and discharges” instead of check-in and check out. “This is definitely about people working with people,” Norm adds. The Journey’s End motel offers four rooms with queen-size beds and six rooms with two double beds in each. The rooms with a queen-size bed have a table and two chairs, as well. All accommodations have large windows facing either east or west and a private bath. Also, each room is outfitted with a refrigerator, microwave, coffeemaker, television and is air conditioned. As for the decorating, that changes in harmony with Sue’s inspiration. She hand-painted and stenciled borders in each room; the sweet patterns, so nicely colored, include apples, cherries, fish and lighthouses. Then, she adorned the beds with linens to coordinate with the patterns and colors. One room we saw had a queen-size bed, a table with two chairs, a charming little chickadee centerpiece and a chickadee border at ceiling height. No need to stand on the bed. Take our word for it; the designs are hand-painted. Sue works hard to please her guests. The couple personally designed the three log cabins here and worked with a builder on construction. Each has a wide and welcoming front porch outfitted with wooden chairs and a table—a gift from the builder. Step inside to a very open and bright great room with a loft. The ceiling and walls are made from pine, and the floor is a wood laminate. The gas stove is quant and certain to keep you warm on fall and winter nights, when you can watch the nearby television; there’s a DVD/VCR, too. “It can actually heat the whole building,” Norm says. If you want to get something cooking in the kitchen, you’ll find all you need—from dishes and pots to a refrigerator and stove. No dishwasher. 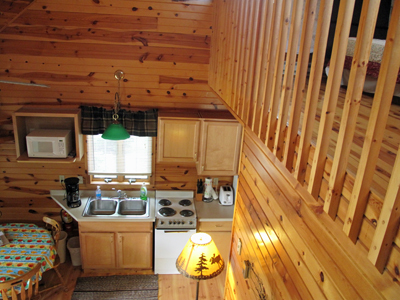 Each log cabin has a dining area, one bathroom with a large shower and is air conditioned. Sue uses her decorative touch in the lower level bedroom, which takes on a north woods theme. The border, linens and lamp shades show deer, bears and evergreens. For your convenience, this room features an outdoor exit, as well. The loft is delightful. Here you’ll find two double beds and a rollaway twin bed under a charming pitched pine ceiling. Journey’s End appeals to people with a wide variety of interests. With its large parking lot and proximity to Lake Michigan, fishermen can’t resist coming here with their own boats or booking a charter fishing excursion. Sue is knowledgeable of bike tours that traverse the Peninsula since so many of the bikers choose Journey’s End for their stay. “Basically, this is good for anyone. We have a comfort level with all we talk to and get to know them,” Sue says. “We get a lot of nature lovers,” they add. And don’t miss an opportunity to enjoy nature right here. 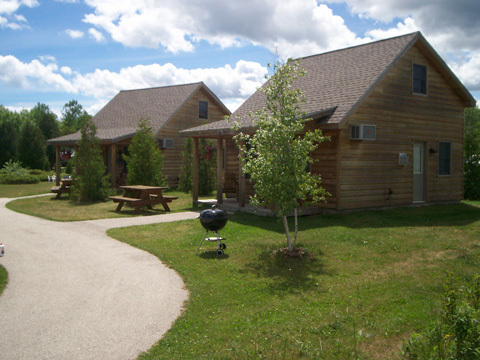 The grounds are home to a fire pit, picnic tables, grills and chairs. Check out the vintage Coca Cola™ machine, stocked with cans of Coke™ for only 50 cents. Still! A breakfast basket filled with homemade sweets and bread, fruit and juices is available during a limited time of the year and may bring you back to Journey’s End for a winter or early spring stay; the motel and cabins are open year-round. And they have winter hours too! Wow- how nice is that? Open year-round, plan a journey to Journey’s End, and see what the fuss is about. Please tell her DoorCountyNavigator.com sent you on this "journey" - by doing so, you keep this site alive & well for you!